During our many years of running Canicross classes, and talking to hundreds of dog owners, it has become clear to us that lots of people are looking for a new way to exercise their dog that has slightly more added interest and challenge to it. Welcome to Canitrekking! Often, they disregard the idea of canicross training, as they don’t want to run or jog with their dog. However, there are many advantages to using the methods and thinking behind canicross and using the kit to go for active, handsfree dogwalk on your own, or with a group. 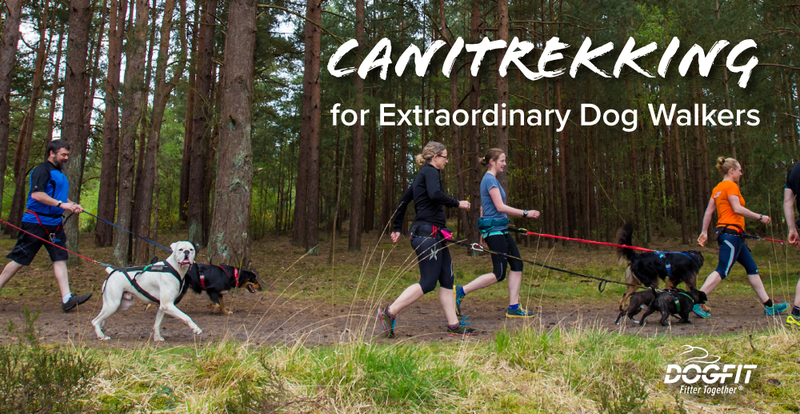 Put simply, canitrekking is going for a walk with your dog, but with the canicross kit: canicross belt with bungee line and dog harness, instead of a traditional lead and collar. You can enjoy spending time with your dog, knowing that he or she is safe, enjoying some exercise and under your full control. Freeing up your hands offers multiple advantages, from feeling safer when negotiating rougher terrain or scrambling under branches etc to being able to carry a drink or map with you. You can also combine a walk with a photo shoot and snap away with a camera or phone to capture some amazing memories. You can literally walk anywhere! Exchanging a lead for the more flexible canicross gear adds a large element of safety to your dog walks, as you know that your dog is always nearby and that you can keep them in control without having to pull on a lead and risk injury to yourself or your canine companion. This is very important when you are walking near lakes and rivers, for example, or where there are steep inclines or sudden drops. The versatility that the kit provides means that you don’t have to worry about whether or not to let the dog off the lease for extra freedom, or how to call him back if you suddenly feel worried about your surroundings. Meaning that you both stay safer and happier for the entire walk! Canitrekking opens up so many more options for where to walk too. Just as the right choice of vehicle allows access to trickier off-road routes, so too can a canicross kit open up areas of the countryside that you wouldn’t otherwise be able to consider. Walking nearer farmland, becomes easier, for example, as you can easily and safely control your dog around grazing sheep, horses and cows without having to resort to a lead or walk miles out of your way to avoid a paddock or field. Having your hands free also means you can tackle uneven terrain more safely, climb over stiles more easily and navigate your way through low-hanging branches and thick undergrowth to discover new areas to explore. Canitrekking is great for group walks too. Using canicross kit means that you don’t have to worry about your dog running away from the group. If your dog is perhaps anxious or doesn’t mix well it is the perfect solution too, as they will be close beside you. Best of all, you are likely to walk further, explore more ultimately increasing your fitness together. It couldn’t be easier to get started with canitrekking. It is a good idea to sign up to an introductory class with an official canicross or canitrekking instructor first, such as those run by DogFit. This will help you choose the right equipment and fit the correct harness size for your dog. DogFit can also give you tips on making the experience unforgettable. You can find details of the DogFit Canitrekking kit here, which is everything you need to get out and start walking handsfree with your dog.